"You Knights [...], lead your followers in battle. Take enough devastation to feed your worm, and a little more to grow, and take the tithe of your followers. Then take another portion, as much as you dare, and use it for your own purposes. But if it is too much, your peers will kill you and take it. Then tithe the remainder to the Ascendant you serve." Knights are a caste of formidable Hive creatures. They are elite soldiers, and typically wield Hive Boomers or a Cleaver. They can also summon a shield directly in front of them for a few seconds to block incoming fire, while regenerating a small amount of health in that time frame. 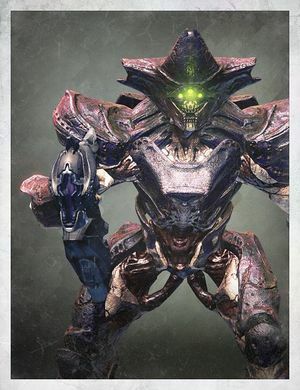 On top of their formidable weaponry and defenses, Knights are even more deadly on Nightfall strikes where they acquire an Arc shield and increased effectiveness with their weapons. Some other knights, such as Blades of Crota or Urzok, the Hated, innately have Arc shields. Knights are promoted from the ranks of the Hive's Acolytes, chosen based on their ability to fight and feed their hungering Worm on the power of conquered foes. In Destiny 2, Knights gain a new look, appearing to sport a horned helmet, tattered cape, and glowing sigil along their faces. "It put up a hand and swallowed the rocket with a wall of shadow." Clad in armor as hard as relic iron, Knights serve as the Hive's forward heavy infantry and are their most versatile soldiers due to their superior arsenal. All Knights are capable of putting forth a Wall of Darkness, a large, black and ovular shield that completely protects them from frontal assaults and restores a set portion of their health. They are also surprisingly fast given their heavy armor, and are far more durable than most other Hive troops. Additionally, when on low health, they will be sent into a berserker rage, rushing towards the player for a high-damage melee attack while regenerating some of their lost health. The weapon they carry will affect their combat behavior. Knights are most commonly armed with a Boomer, a handheld siege weapon capable of launching explosive Arc bolts that have devastating splash damage properties. Each bolt has a long effective range and can easily be fired one after another, forcing Guardians to fall back to another position on the battlefield while allowing the Knight to slowly corner his target. Since this dissuades any sort of close range combat, long-range weaponry with sustained damage output will fare the best against such Knights. Alternatively, they can also be seen with a Shredder, a one-handed carbine that launches Void bolts one after another. While in the hands of an Acolyte, this weapon doesn't deal much damage, but in the hands of a Knight, it is far more accurate and has a faster rate of fire. This means that the player can get more easily suppressed by them. Knights with this weapon tend to stick to a certain distance and will try to re-position themselves if they are overtaken. Concentrated fire at any range will hold them in one place. Knights armed with a Cleaver are some of the deadliest close-range enemies the player will encounter. They will constantly rush towards their target to land a series of powerful sword strikes, and will not stop until they kill them. Keep them at a distance to negate the use of their weapon and concentrate your fire on them to keep them stunlocked. Knights behave the same as before, but most now carry new crossbow-like weapons called Splinters, which shoot a fanning spread of Solar bolts. In Warmind, new variants of Knights appear under the Grasp of Nokris faction. Some Knights wield their trademark Cleavers but are also equipped with a shield. The shield provides enough protection for the Knight to close the distance with its target but it can still be destroyed. Otherwise, the Knights remain the same. Blades of Crota—found in Old Russia and the Moon. Drops a Sword when killed. Blade of the Pit—found in the Abomination Heist. Gatekeepers—found in Crota's End. Can only be killed by a Sword. Light-Eater Knights—found in the Hard version of King's Fall. Acts like the Vessel of Oryx, except that it does not have an Aura and is not a Major. Swordbearers—found in Crota's End. Drops a Sword when killed. Vessel of Oryx—found in King's Fall. Consumes Corrupted Light and holds an Aura of Immortality that must be taken by the Brand-Claimer in order to kill it. Vanquisher--found in the Hellas Basin on Mars. Armed exclusively with a Cleaver and a shield. A Hive Knight charging with its cleaver. A Titan and Warlock facing off against a Knight. A Knight attacking a Guardian alongside a Cursed Thrall. A Knight Slashing a Guardian. A Knight at the Shrine of Oryx fighting a Guardian. A Swordbearer from Crota's End. A Knight from Destiny 2. A high poly render of a Knight from Savathûn's Hive from Destiny 2.